When we want to buy something handmade and branded, it will surely be very expensive and precious. We are the handiwork of Christ, and we are branded by His Name. We are precious in His sight, for we are His precious handiwork. You are precious, more than you ever know it. And you are precious for the world, more than the world will ever know. 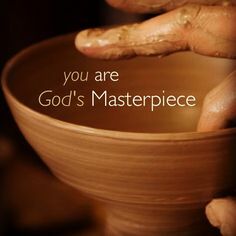 You are specifically made for God’s good work. Embrace that calling that comes from within your heart; your dreams, your good desire, and the urge from within to do the right thing and help other people. Embrace the call of Grace from God, to keep on believing in God every day for the rest of our lives; even though we may not see Him now. When something is invisible, it does not mean that there is nothing. Air is invisible, but we cannot live without the oxygen in the air. The same principle is applied here. We cannot see God right now, and that is the reason for most people to stop believing in God and consider it as a fairytale that our parents told before we went to bed. But, even though we cannot see God now, it does not mean that He does not exist. God is real. Heaven is real. Miracle is real. There are a thousand ways that human can die every day, but the fact that many people lived until 70 years old is a miracle. Remember, every day is a miracle. Every day is a gift, no matter how harsh your condition or situation is. Your life is a gift. And it will get better as time passes by. When God created you, He has a purpose in His mind, and I believe that He has put that very purpose inside your heart. So think about it, pray to God, and accept the calling of God that you have in your heart. Remember, God has prepared in advance the things that He wants us to do in this life.